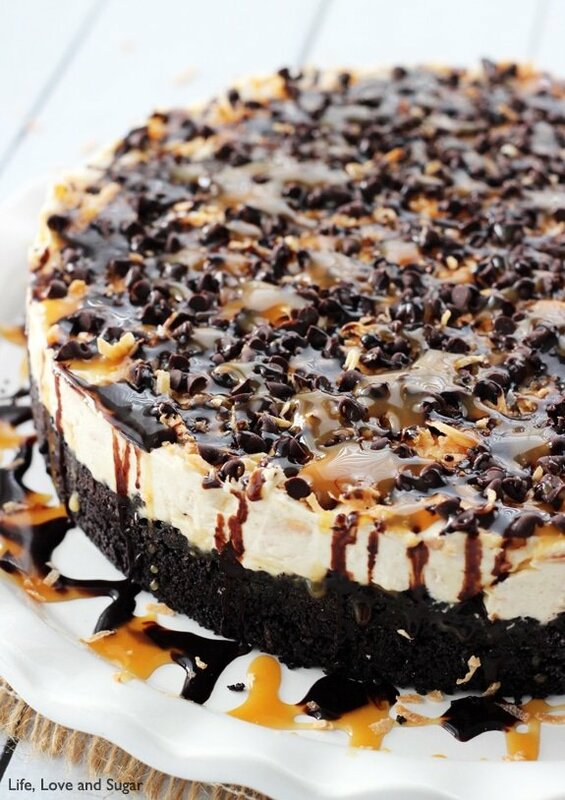 This Samoa Cookie Cake is absolutely to die for! 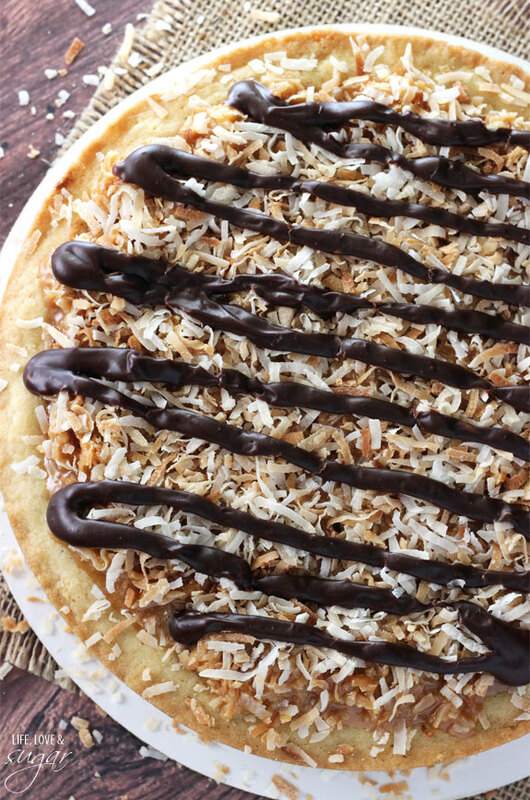 A moist and chewy sugar cookie is topped with chocolate ganache, gooey caramel filled with coconut, then drizzled with chocolate on top! 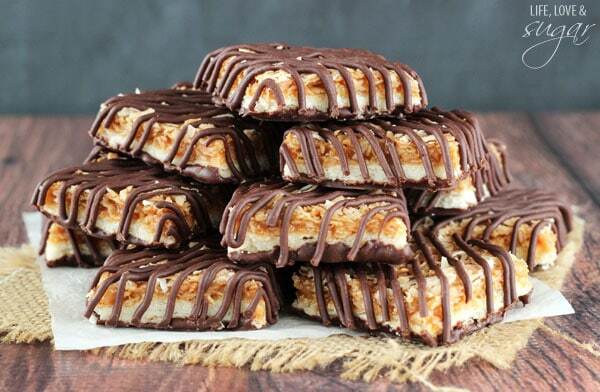 It is soft, moist, gooey and even better than any Samoa Girl Scout cookie you’ve ever had! So if you follow me on instagram, you’ve probably seen several photos of me having a great time out at the Food Blog Forum conference over the weekend. It was hosted at Walt Disney World and it was awesome! Such great info, so inspiring, great people and great fun. I’ll be telling you all about it soon. I left a day early and came over to Daytona Beach, FL – only about an hour from Orlando. My grandmother lives just a few minutes from the Daytona Speedway. She broke her arm back in December, so I came over to see her and help out where I could. I’m still here now, but sadly will be leaving later today. She’s getting some movement back and doing physical therapy, but she hasn’t been able to get out of the house much and get things done, so it was great to be able to get her out and about and spend some time with her. She’s a lot like my mom – or should I say my mom’s a lot like her – so she’s basically awesome and I love hanging out with her. We went to her physical therapy appointment yesterday and it was nice to be able to see how she’s doing. The people working with her were so nice and they told me all about how much they love working with her. She doesn’t complain (she wants to get better as quickly as possible), will do whatever they ask and is full of personality – she always has been. Apparently they all want to be the one to work her and I’m not at all surprised. We’ve gotten some things done over the couple days I was there and have watched some fun things at night. I got her to watch “The Bachelor: The Women Tell All” with me on Monday night and she was hilarious. She’s not a fan of the show. She’s not into the drama and all the crying and bickering, so that particular episode, which was full of the women bickering and crying, was particularly funny to watch with her. I’m bummed to be going home today and I wish she lived closer, but it was nice to have a couple days to be with her. And I’m excited to share this recipe with you. This cookie cake is definitely one of my new favorites! It is completely addicting. The sugar cookie on the bottom is thick, moist and super soft. It makes a great base for all the toppings. And the dough is easy to make and doesn’t have to be refrigerated, giving you a big cookie quicker. The cookie is first topped with a layer of chocolate ganache. Then it’s topped with Kraft caramels, mixed with a little butter and water, coconut and more chocolate. The caramels are melted with the butter and water, then the coconut is mixed in. That mixture is very best part, in my opinion. Mmmmmm caramel and coconut. It’s just like a samoa. 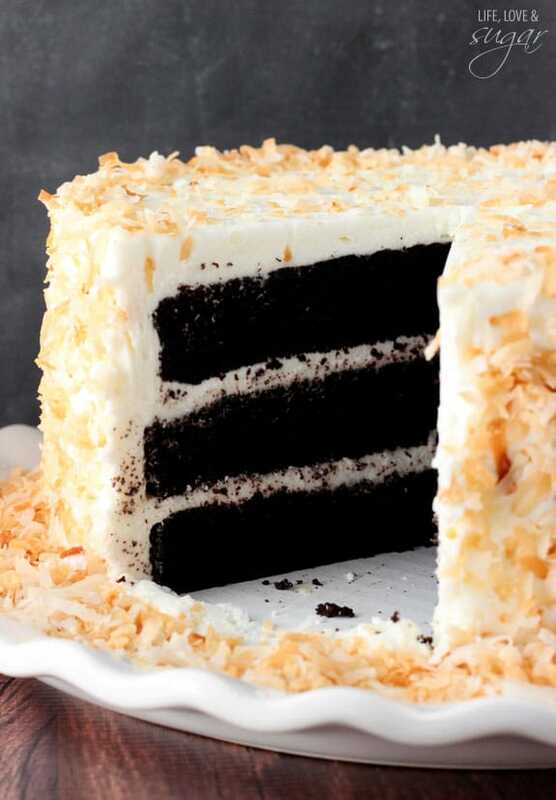 And of course, no samoa cookie cake would be complete without the drizzle of chocolate on top. 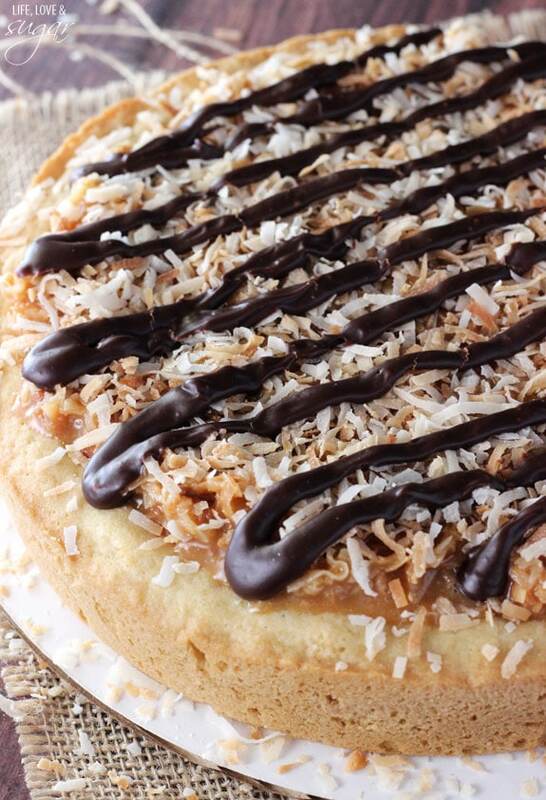 I have no doubt you will love this cookie cake if you love Samoa Girl Scout cookies. 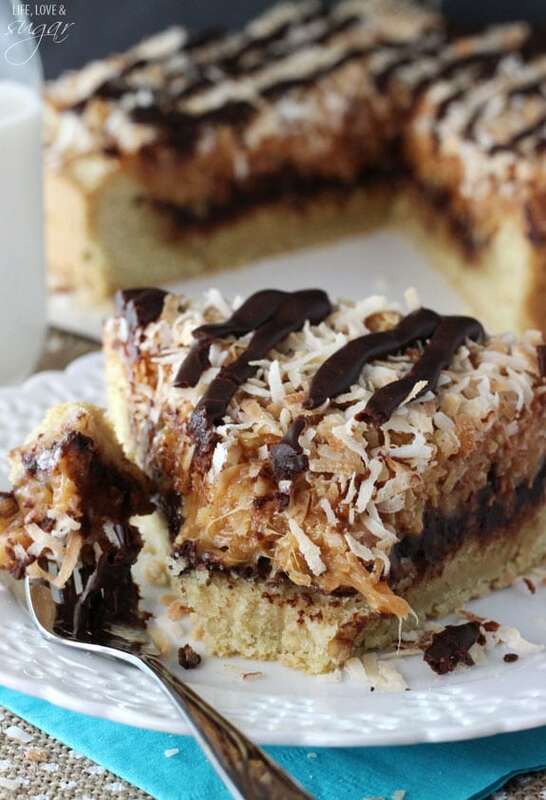 It’s seriously amazing, gooey and even better than any samoa cookie you’ve ever had. 1. Prepare a 9 inch cake pan with parchment paper in the bottom and grease the sides. Preheat oven to 350 degrees. You could also use a springform pan instead. 3. Mix in eggs and vanilla extract. 4. Add flour, cornstarch, baking soda and baking powder and mix until well combined. 5. Press cookie dough into an even layer in the cake pan. 6. Bake for 19-21 minutes. The center of the cookie will still look a little undercooked, but that’s ok. Remove from oven and allow to cool completely in pan, then remove from pan. 7. Once cookie is cool, make the chocolate ganache. Place chocolate chips, heavy cream and butter into a microwave safe bowl and microwave for about 30 seconds to a minute, until cream starts to boil and butter begins to melt. 8. Whisk chocolate until completely melted and smooth. Microwave for a few more seconds, if needed. 9. Set aside about 1/4 cup of the ganache and spread the rest on top of the cookie cake. 10. To make the caramel mixture, add water, butter and caramels to a pot and melt over medium heat until smooth. 11. Reserve about 1/4 of the toasted coconut, then stir the rest into the melted caramel mixture. 12. 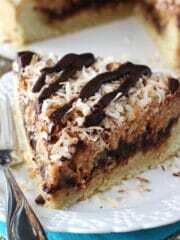 Spread the caramel coconut mixture on top of the chocolate ganache. 13. 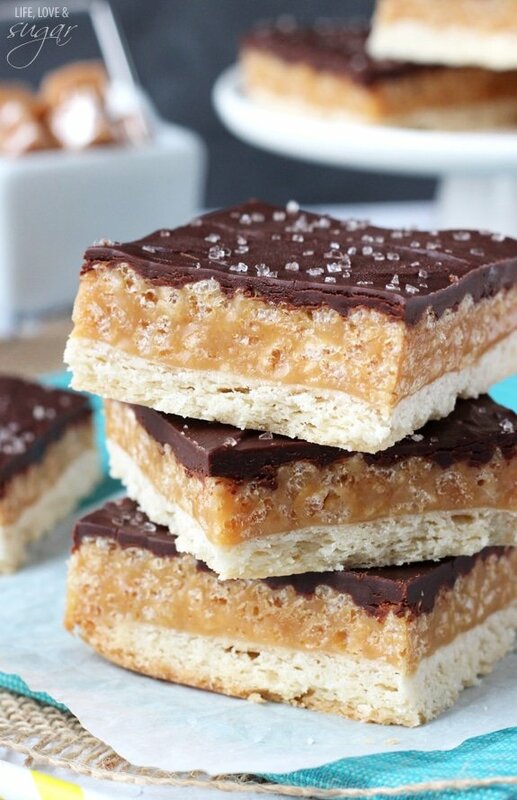 Sprinkle the rest of the toasted coconut on top of the caramel mixture and lightly press it into the caramel. 14. 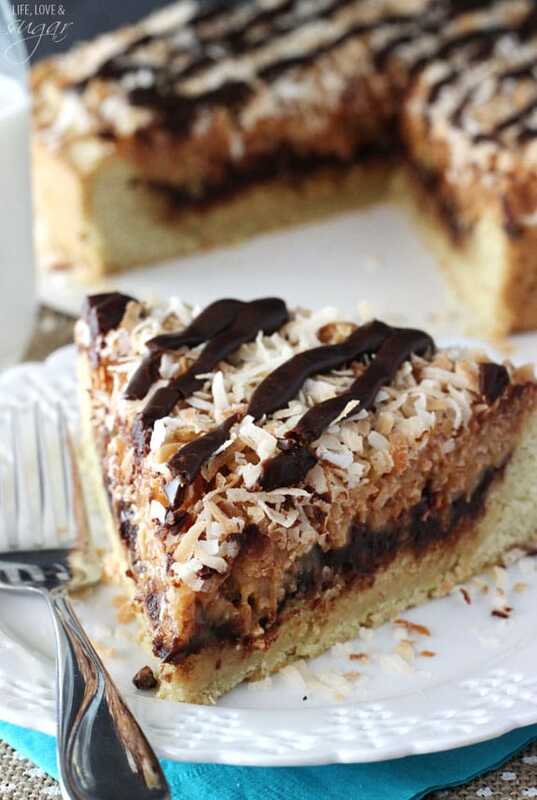 Drizzle the rest of the chocolate ganache over the top of the coconut and caramel. 15. Allow the caramel to cool, then serve. 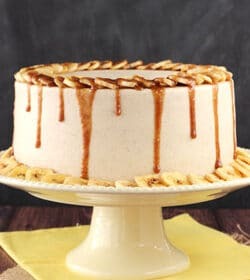 You can serve it while it’s still a little warm, if you want the carmel a little more gooey and melty, or serve it completely cooled. It’ll still be gooey when cooled, as well. 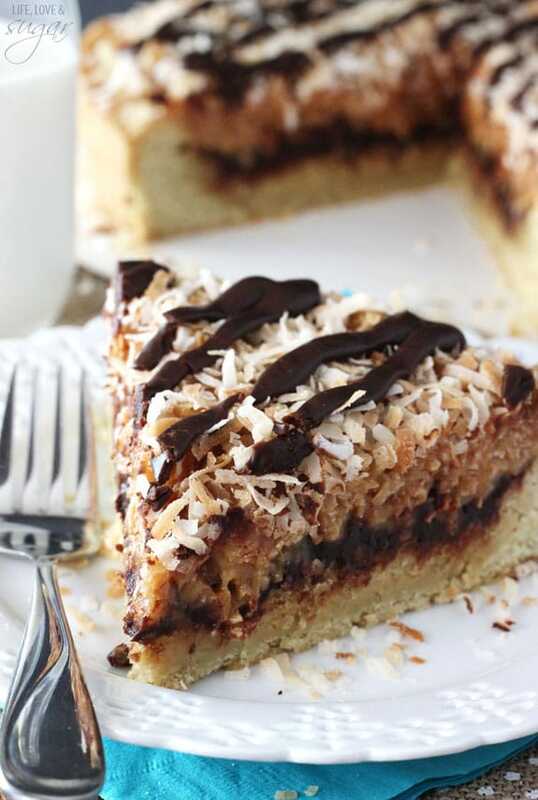 Love this Samoa cookie cake! And the best part is, yours is better than the cookies themselves! I’m loving that ganache! I SO wish I could have gone to FBF! If only i still lived in FL!! Nice that you got to spend time with Grams though. I totally just got my hubby addicted the the bachelor. BEST. Well. almost best. This cookie cake? it’s the BEST! HOLY YUM. Pinned! It’s funny, samoa cookies are one of the last ones I would pick up, and yet every dessert I see made inspired by them looks awesome. 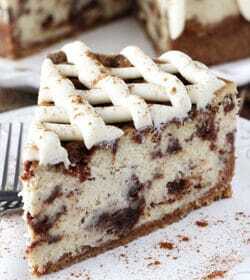 This looks samoa cookie cake looks so so yummy. Wow, just wow! I am so in love! This is the only cake I would ever need! I am soooooo in love with this cookie cake! So happy you got to spend some time with your grandma. Hope her arm heals up soon. Love this cookie cake! 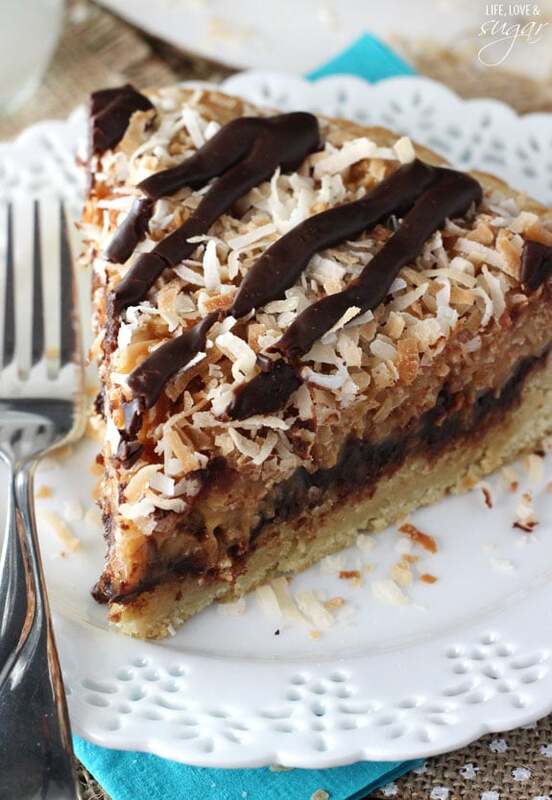 Samoas are my favorite and I wish I had big slice of this right now! Lindsay, so awesome that you had a such a great trip and got to see your grandmother! I was living vicariously through everyone’s IG feed when you guys were at FBF! 😛 I gotta be faster next year! 😛 love this cookie cake!!! Samoas are my fave!!! 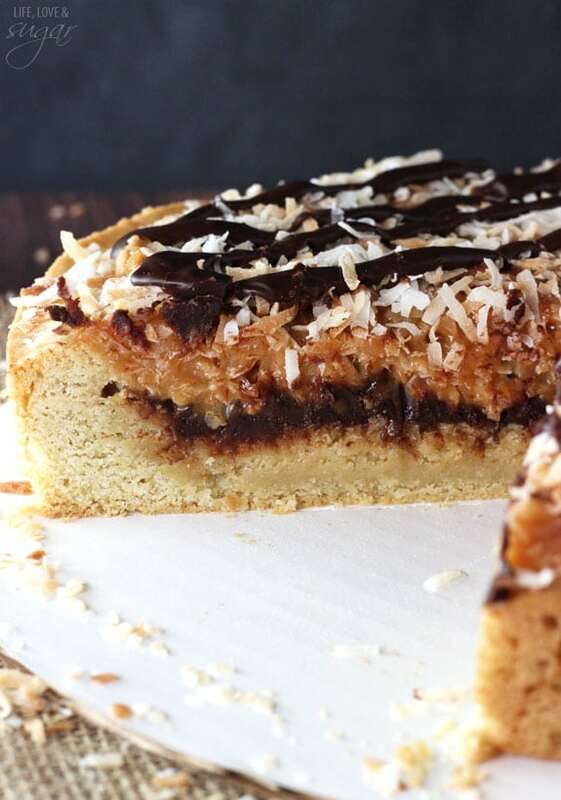 I’ve never had a samoa cookie before but this cookie cake looks truly magical! I made this last week for an event, and it was fantastic! I think I baked the cookie slighly longer than I needed to, however. The center didn’t sink in enough to make kind of a crust / wall for the toppings, so the caramel and chocolate just sat on top of the cookie (and some dripped over the sides). I should have realized that, as mentioned in step 6, you WANT it to be a little undercooked in the center. Will make again! I love your recipes! Cookie cakes have become my new go-to! 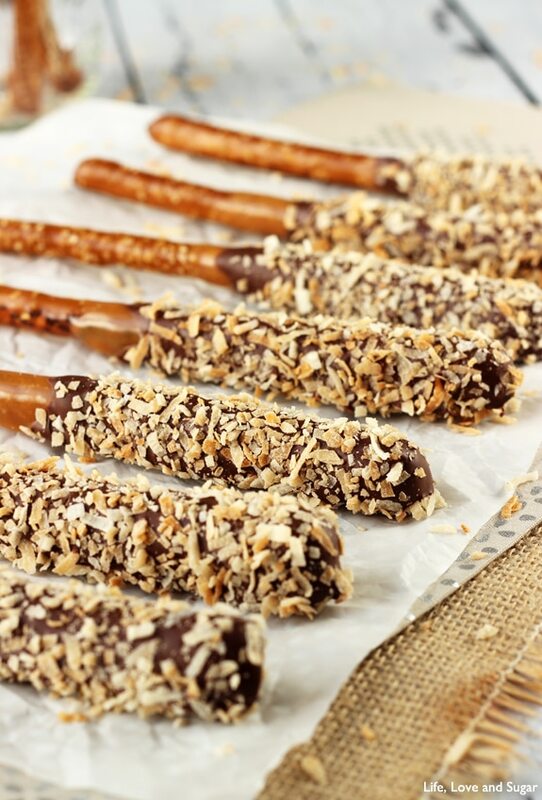 A question: Do you measure by weight or by volume when you bake these? I’ve been converting to weight for more precise baking. 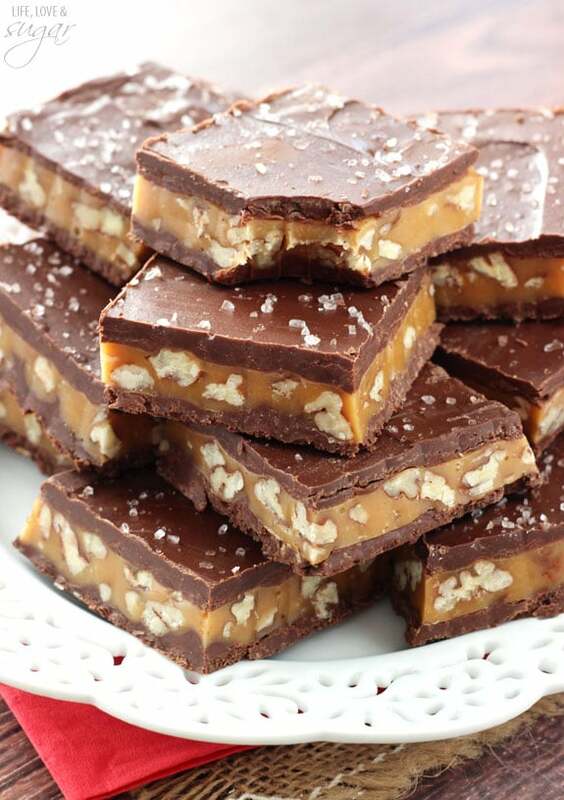 Is there any way that you could tweak the recipe to use your homemade caramel sauce instead of the pre-bought caramels? I think so. I’d suggest this caramel sauce. I’m just not sure how much caramel sauce to use in place of the caramels – I’m guessing somewhere around 1 1/2 cups. Also, the homemade sauce isn’t as firm at room temperature, so keep that in mind.